Consider this regal tabernacle for your church or chapel to reverently house the Blessed Sacrament in reserve. 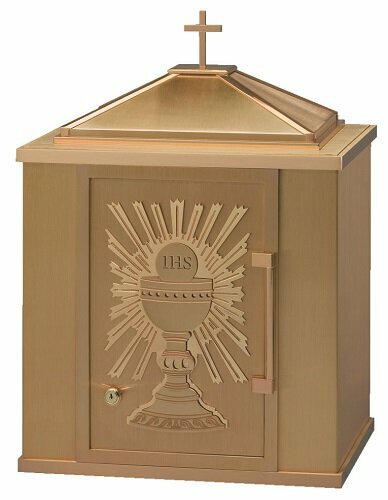 The tabernacle measures 25" inches high from the base to the cross with width of 18". The hinged door is embellished with a Chalice and Eucharist in the foreground of a sunburst design. Note: Due to the size and special shipping requirements of this product, this item requires special freight charges rather than the freight chart. Please contact us for a rate quote. Size: Height 25", Base: 18" W x 14" D, Door: 9-1/2" x 15", Inside depth. 12"